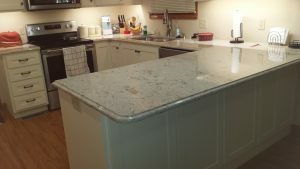 K&D was excellent to deal with when we purchased our new countertop. From picking it out to having it installed, I couldn’t have been more pleased. Thank you K&D for making our kitchen look so beautiful. 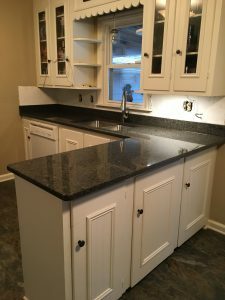 We are very pleased with our countertops the installation guys did a great job and advised us of leveling issues with our cabinets and allowed us time to get right. Thus far our only complaint is with one of the faucets we selected but we expect the problem will correct itself in a few days. All aspects of our recent countertop project with K&D was very good. From choosing a color to the templating and installation, we were very satisfied. This is our second top and we would not hesitate to use their services again if we needed it. We are very happy with our kitchen countertops. K&D employees, Cody and Josh, were very professional and did a great great job. We love our kitchen countertops! Installers, Josh and Cody, were prompt, courteous and very professional. They did a great job! I love my new vanity top! It turned out exactly as I had envisioned. The staff couldn’t have been more knowledgeable and helpful and their products are beautiful. I would highly recommend them! The service they provide is top notch! Had a great experience with Chris and Tyler. They were here at stated time and wasted no time getting started. They were very knowledgeable in their installation. They ran into a few issues due to our older home and made adjustments to make everything work. The countertop is so pretty and we are very pleased with the work they did. It was a very pleasant experience. Easy to order, timely appointment to measure and seamless installation. Cody and Josh were very informative. Thank you. Excellent work and service. They came right on schedule for the measuring and installation and couldn’t have don a better job on the installation. Perfect workmanship. 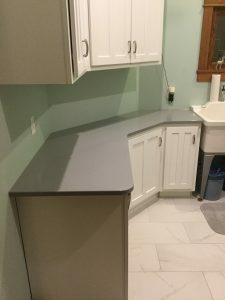 Everyone was a pleasure to work with and help me decide which counter top would look great with the colors I choose.. they were awesome about communication and giving time frames of when to expect. Easy to work with. The selection and installation were easy. Counters are gorgeous. 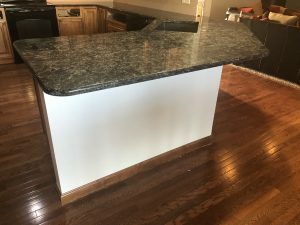 I was very impressed with the gentlemen Eric, Jarod and Dustin with the measurement and installation of my quartz countertop . They were very knowledgeable and personable! I really appreciated their expertise and letting me watch and ask questions. They are definitely experts in their field. I love my quartz and will always get Cambria for my future projects. Again Thank you! All aspects of the process were done in professional fashion with a true care for our needs. I am very happy with the service I received before, during and after from K&D Countertops. My countertop is absolutely beautiful & has completely changed the looks of my kitchen. I would definitely use them again. Eric, Dustin and Jarrad were friendly and professional and did a great job installing our countertops! We loved working with Kelly at K&D Countertops. She provided lots of information and support on the process, from picking the color, to ordering, preparing, and delivering. We are retired and all I can say is this was the best experience we have ever had working with a contractor/vendor. Love our countertops and highly recommend this company. We started looking for our countertops at another local shop on the recommendation of our cabinet supplier. We quickly found out that they were over priced and almost made us feel like it was an inconvenience for us to be there. We decided to go and look at K&D in south county. From the start everything was easier. I already had plans for our kitchen and was able to get a quote within minutes. Instead of the other store marking down a number we picked and waiting for 3 days to get a much higher price for a lesser product. We had our 18 month old with us while looking for counters at K&D and she was more than entertained. It really felt like we were working with a friend and not a company. Even all the way to the guys installing the countertops. We went with a cambria countertop over a granite top. And the cambria was cheaper than the granite and much nicer. Save yourself time and money and just go to K&D. Great experience from beginning to end. Allissa help in the showroom was excellent and very personable. Love my install. What a wonderful experience! Anna was so patient and helpful! The technician who completed the measurements was very detailed and the installers extremely professional. Everyone provided an fabulous experience and a beautiful final product. It was great working with Jeremy at K&D in Trenton! I was back so many times trying to make up my mind and he was very patient and knowledgeable each time. The guys who installed it yesterday were very courteous and did a great job also! Wes was great to work with. We refinish old cabinets, so it was a little bit challenging to level. They did a great job. Very pleased with work crew, very friendly. My wife Barbara and I are elated with our new Cambria countertop. It looks fantastic! Installation top quality by a great crew. Very professional with a high regard for our concerns and expectations. They were more than we could ever have expected. Outstanding product and service. Would recommend K&D to anyone. Absolutely wonderful to work with. Did everything they said they would. On time and excellent installation.